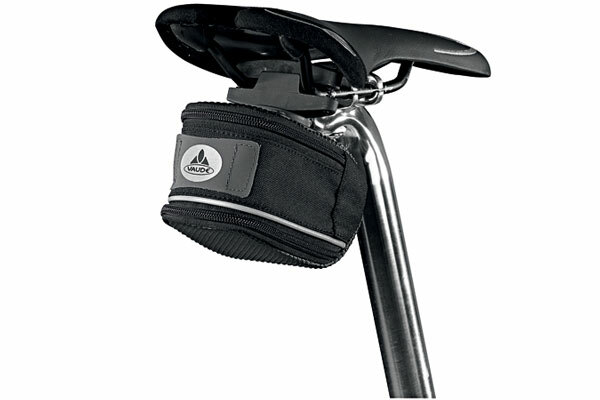 A small seat bag for roadies (road bikers) and minimalists. Sized for a tube, tire levers, patch kit and mini tool. Holds 33 cu. inches of cargo. Made from heavy-duty denier nylon. Has a loop to attach a safety light. The Banjo Brothers are deadly serious about product quality and want to make sure that you only say nice things about us when talking the finer points of bike accessories with your pals. We vow to stand behind any product that is defective. Our warranty policy is simple — if your bag is messed up due to a defect in materials or workmanship for the life of the bag, we fix it no questions asked. That doesn’t mean you can beat the living snot out it and expert to return it to us as defective. I think we can both let common sense be our guide here. Think of it this way, if your Mom would be OK with you claiming something as a product defect, then chances are it is a defect and the bag should and will be repaired or replaced. There’s plenty of evidence to support our claims of being fair minded on the “internets” – so there you have it. Bags will be repaired or replaced at our discretion. In many cases, if you don’t live next door, product photos, concise descriptions of your problems, how old the product is and where you purchased it are all keys to having your problems solved quickly and without hassle. You can also “Register Your Bag” on our site to keep track of some of the details.